Drivers on road need to follow traffic rule, said Director Transport Tage Tado while attending a Masse meeting and awareness programme organised by Naharlagun Auto-rickshaw Welfare Association (ANAWA) today at a city hotel. Addressing the function as chief guest , he said that ‘rules, regulations and guidelines are modified from time to time for the convenient of all and to prevail the rule of law by the agency and administration. There should be a fear in mind to be caught by law enforcing agency among all driver and to pay a heavy fine and in view of that all should follow the traffic rule. Since the road in capital complex is under construction and we should change our mindset and attitude and behaviour while driving our vehicle including commercial vehicle that our negligence would create inconvenience and would be a source of accident even fatal one. He urge upon all stake holders to make awareness to maintain discipline while driving and obey traffic rule on road. Do not mix drink with driving and take precautionary measure while driving for other safety. He assured his full support in all activities of the transport federation and its allied organisation in all related matter. Guest of honour All Arunachal Pradesh Tour Operator Association (AAPTOA) President John Panye said that “There have been several instances of traffic violation by the members even by others but the blame goes to us which need to be reduced as to get a clean and clear image in front of others”. Capital is the face of state and we as a members of the union/association and federation here at capital need to show our good behaviour and guest welcoming attitude to others which will automatically upgrade our status. There is a need of change in behaviour with a discipline and emphasis on wearing of a uniform by commercial vehicle drivers like of other state does. He also urge upon for maintaining good relationship with administration and police and obey traffic rule for betterment of others and smooth functioning of transport system in capital and state as a whole. 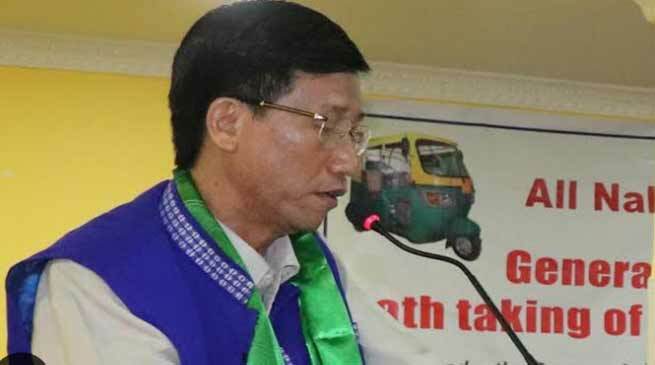 All Arunachal Pradesh Public Transport Federation (AAPPTF) President Dobing Sonam in his address said that ‘unity is strength’ and appeal one all transport federation and transport association members to join hand together and show our strength for a better Arunachal by following several traffic rules. He urge upon all members to verify themselves that their vehicle is roadworthy and documents are updated and follow traffic rules which are mandatory for commercial vehicle owners as well as drivers. He appeal all the members concern to obey traffic rule and coordinate capital district administration including all stake holders for better traffic system in capital and state. ACCFU (AAPPTF) President Tarh Kaha, Secretary Kiogi Gichik Tagia, Finance Secretary Dado Londa also address the gathering. The mass meeting and awareness programme was organised by All Naharlagun Auto-rickshaw Welfare Association under banner of All Arunachal Pradesh Public Transport Federation attuned by several auto-rickshaw owners and drivers of the township.